We’ve seen a rapid adoption of the progressive agenda into cultures all over the world in the last decades. And most disturbing is the fact that this agenda has crumbled the Christian foundation that many countries were founded on. The countries of the U.K. are perhaps the worst offenders in spreading liberal propaganda, but a recent story from that region offers hope that all is not lost. Scotland and neighboring Ireland have been predominantly Catholic for thousands of years. But all of the British Isles have experienced their governments pushing progressive ideology on their citizens instead of preserving Christian values. One such example is that of a Scottish shopping mall that banned the placement of a nativity scene on its property at the beginning of the Christmas season. The Catholic organization, the Legion of Mary, requested that they be able to place the traditional symbol of Christmas in Thistles Centre alongside all the Santas and Christmas trees. Despite pleas from the Catholic Archdiocese to reconsider with the point that the nativity is the only reason citizens celebrate Christmas at all, mall management wouldn’t budge. A spokesman from the Church of Scotland commented, “When a shopping centre can focus purely on commercialism to the exclusion of the reason for the celebration of Christmas, it is a sad day for all of us,” according to LifeSite News. The incident was reported in several Scottish publications, with one’s headline even asking the question of whether Christ should be removed from the celebration of Christmas altogether, making it a secular, rather than Christian,holiday. The story could have ended there as it so often does — with Christians being censored and prevented from expressing their beliefs — were it not for two young adults who wouldn’t give up. 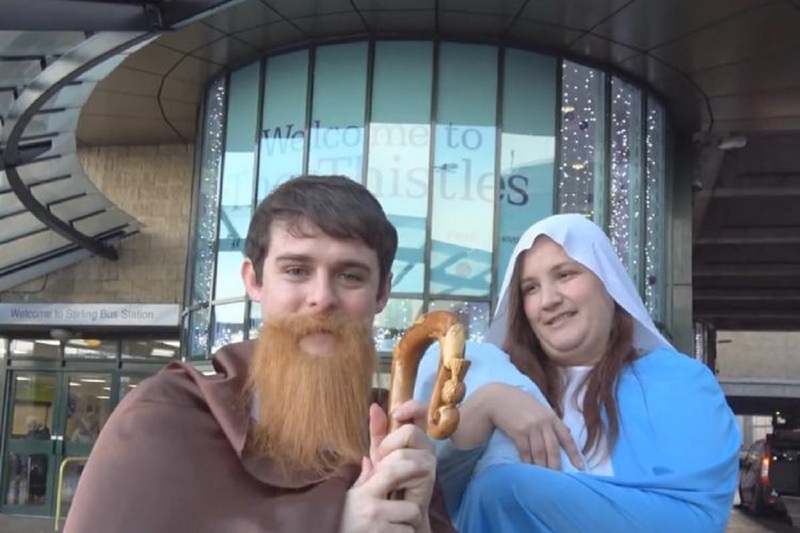 John Mallon and Elena Feick dressed up as Joseph and Mary, who carried the Baby Jesus in her arms as they walked around the mall spreading messages about the true meaning of Christmas. “The Christ child came to this world in secret. We came to Thistles in secret. But like [with] Jesus, the whole world would soon know,” said Mallon, according to LifeSite News. They brought with them another friend to film their encounters. Security guards told the couple they would have to leave and filming was to cease. The group did so after walking around a bit longer in the mall, but not before they received several surprising comments. Mallon and Feick said that nearly every shopper in the centre smiled and greeted them, cheering them on and wishing them a Merry Christmas. They note that even the mall Santa that day seemed to smile and welcome them after his shock at being “upstaged” wore off. The pair said they didn’t hear a single objection from mall shoppers about their presence or the message they were spreading. After going viral on social media and being reported in the papers, the “Holy Family’s” visit sparked a change of heart for mall management,prompting them to release a public statement. Whether it was to save face with the public because of the overwhelmingly positive response or to benefit from the publicity, the decision was welcome news to Christian shoppers. Mallon said that the couple’s mission was to reinforce the real meaning of Christmas, based in the Christian religion that is overwhelmingly “undermined” in modern cultures across the globe. Thistles Centre reached out to the Legion of Mary to welcome their display for the rest of the Christmas season and the organization accepted. Spokesmen for the Archdiocese also commented on the decision, saying that mall management should be commended for listening to the wishes of the public and for respecting and upholding religious liberty. It seems that like Mary and Joseph before them so long ago, these young Scottish friends have made a statement for all the world to hear. And it gives us hope that the progressive agenda to eradicate Christ from Christmas is not going to be accepted so easily. What do you think of this heartwarming story? Leave us your thoughts – and Merry Christmas!